Fanuc CNC Custom Macros: Programming Resources for Fanuc Custom Macro B Users is an invaluable companion to the author’s best selling CNC Programming Handbook. These programming resources provide a general introduction to the subject of macros (known as Custom Macros or User Macros). Users learn what macros are, how to develop them, and how to use them effectively. Fanuc CNC Custom Macros also explores important related subjects and identifies several other helpful topics in this increasingly important and exciting field of CNC programming. • Well-illustrated in the Smid style, numerous examples and sample programs are used throughout. These serve as practical applications of the techniques presented and as the basis of ready-to-run macro programs. 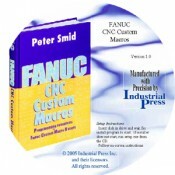 The following is an abbreviated Table of Contents for Fanuc CNC Customer Macros. A comprehensive 10-page Table of Contents (PDF) is located here. • What's on the CD?